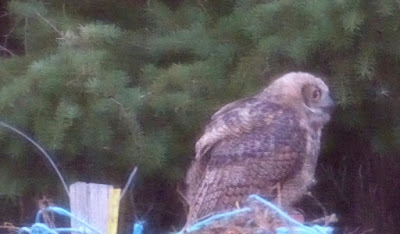 We have a couple of owls hanging around here, and I don't know what species they are. Nor do they appear to be a Northern Hawk Owl. 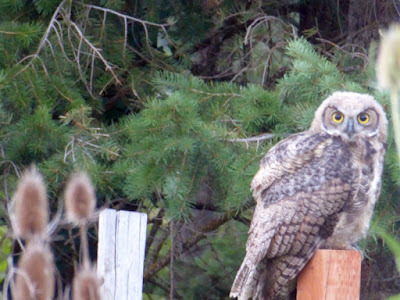 Typically these mystery owls are audible (in pairs) in late evening, all through the night, and into early morning. Notice the yellow eyes and black beak. 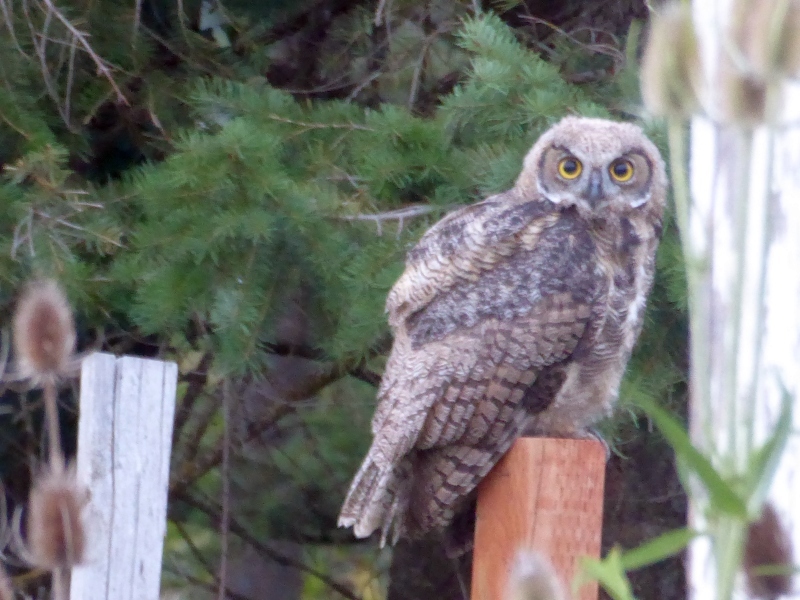 They have a harsh screeching cry, unlike the melodious Great Horned Owl's call. 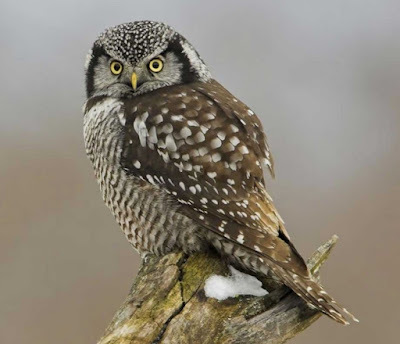 From my days as a field biologist, I'm very familiar with Great Grey owls, Barred owls, and Spotted owls, and know without question this isn't any of those species. 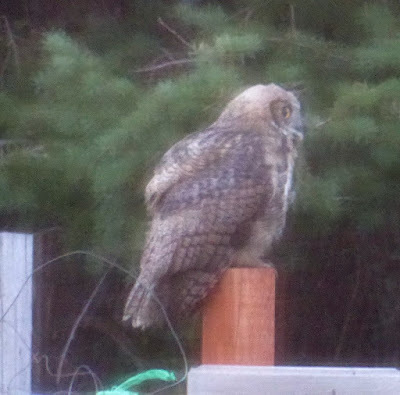 Yesterday morning I caught some shots of the mystery owl. I was on maximum zoom and frequently taking photos through a screened window in very early morning light (meaning, dim), so the photos aren't always clear or focused. Below are the clearest shots I took. Any thoughts about the species? UPDATE: You guys nailed it! It certainly seems to match with a juvenile Great Horned owl. In fact, here's a YouTube clip with the very sounds we've been hearing: begging cries. Since we have NOT been hearing any adult Great Horned owls nearby, I can only conclude these two youngsters (we always hear them in pairs) have just been booted out of the nest and are trying to figure out how to be adults. 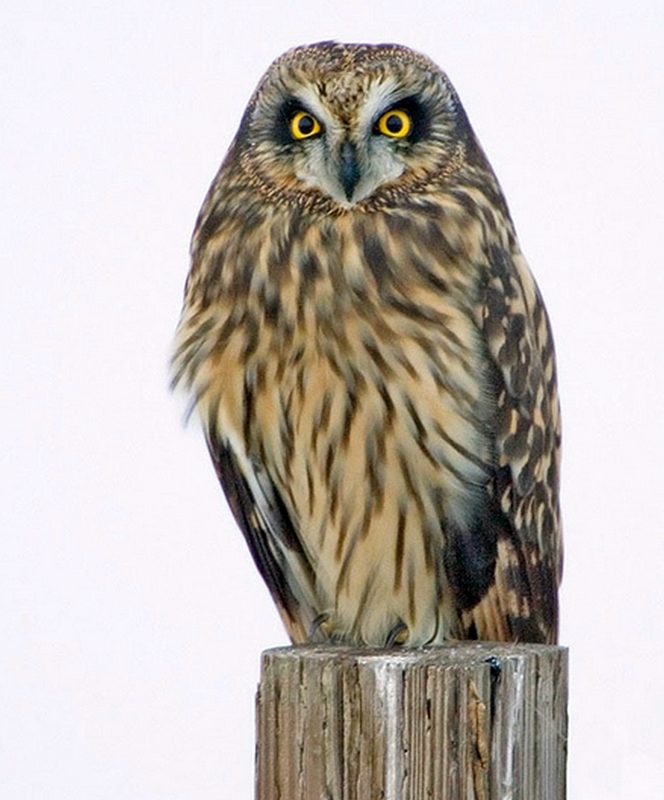 It may be a young owl whose feathers and calls may not be fully developed. Patrice by no means an expert here but it appears to be a juvenile bird. Might be a short eared or maybe even a great horned. I googled juvenile owl images and the 'horns" aren't apparent on the younger birds. A young Great Horned Owl??? Maybe? Looks like a juvenile great horned to me. 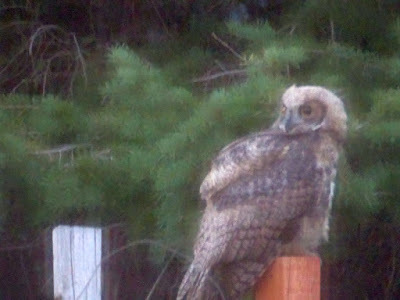 Looks like a juvinal great horned owl. The beak is dark and there seems to be the beginnings of tufts. Sibley says juvinal have a "high wheezy, scratchy or hoarse" call. Don't know how I missed "Juvenile" twice! No matter what kind of owl he is, he is scoping out your chickens. Be ware. Quincy, Mi. 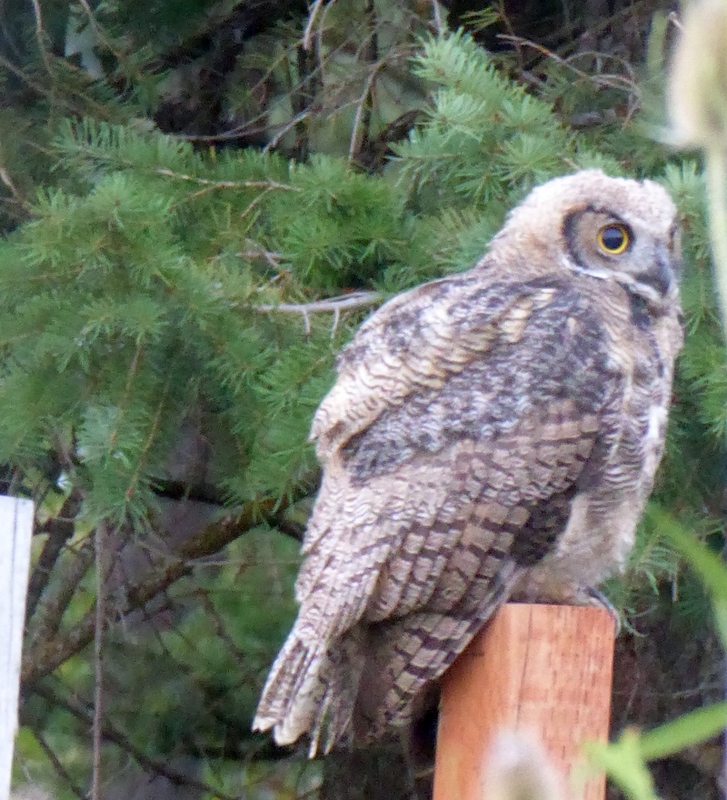 here to say, young Great Horned Owl, we have lots of them here.